We're still just a few months into 2015, but it's already shaping up to be a great year for fried chicken in New York. From Momofuku's fried chicken concept, to everyone's favorite chicken sandwich slingers, there's a lot exciting stuff happening on the fried-bird front. But, brace yourselves/prepare to head to Williamsburg, because there's even more coming. Daniel Delaney's Delaney BBQ, famous for its no-frills approach to serious Texas-style BBQ brisket, announced on its website that it has a mysterious new fried chicken project in the works. "We locked ourselves away in the bowels of Brooklyn armed with more chicken than one could eat in a lifetime," the announcement reads. 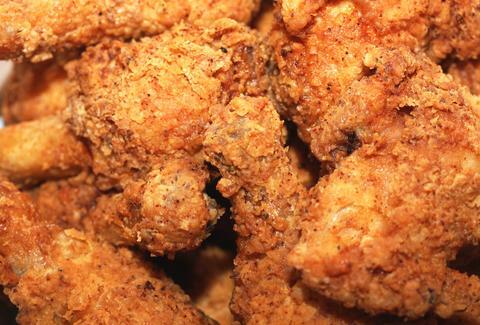 First of all, challenge, we're pretty sure there's no limit to how much fried chicken we could eat in a lifetime. Second of all, we're damn excited. While no official date for the bird premiere is given, it does say "the months of toiling over a cauldron of fat will soon see the light of day," and closes out with: "H8RZ Beware." Never have we ever felt this simultaneously threatened and hungry. You can fill out a form on the website to find out more about the "glorious fowl," and we suggest you do, like, right now. You can also follow the fried chicken lab via the hashtag #cockpocalypse2015, which... we're just gonna leave there. Lucy Meilus is an Editorial Assistant at Thrillist and would like a lifetime supply of fried chicken please, guys. Follower her on Twitter at @Lucymeilus.